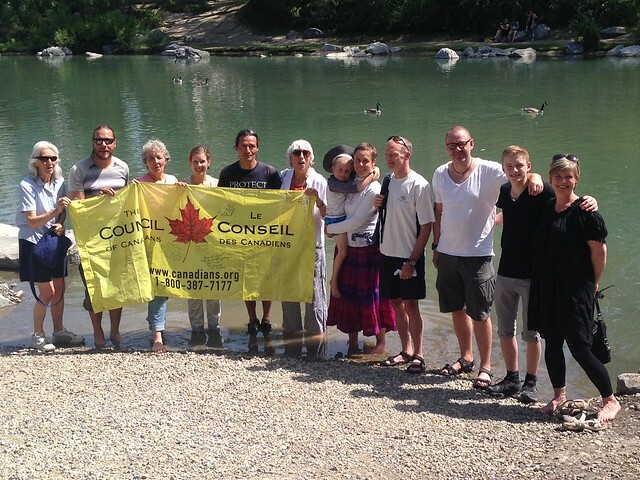 The Council of Canadians Calgary chapter greeted Indigenous ultra-marathon runner Caribou Legs yesterday. On their Facebook event page for this picnic potluck greeting, the chapter said, "Please Join us at the Eau Claire Market to welcome and meet Caribou Legs, learn about what inspired him to take on the this running adventure and discuss what we can do to help protect our lakes and rivers." 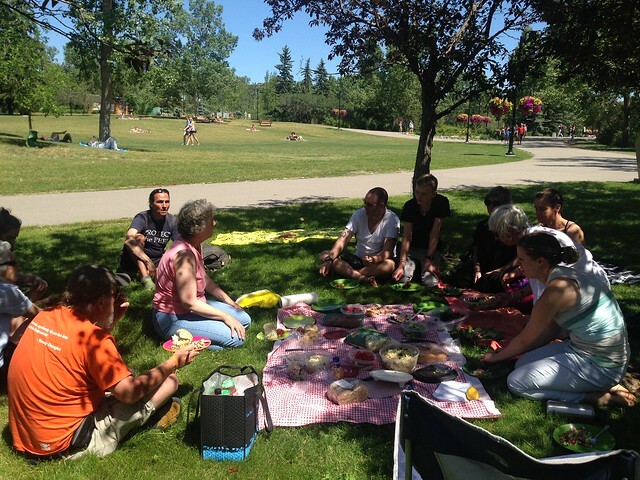 Edmonton-based Council of Canadians organizer Aleah Loney travelled to Calgary for this gathering and tells us, "We had a sharing circle, then talked over food. Each person shared their story, from one man who grew up in near Palestinian communities lining up for water to a family of Danish people who met one of our supporters (who has made this video) in Jasper on their visit and were so inspired by the story of Caribou Legs that they came to the meet up! Incredible stories shared. We spent about 3 hours together, around 15 people. We also handed out a bunch of flyers. It was a fantastic Saturday." Caribou Legs began his run on June 1 in Vancouver. With his arrival in Calgary late on June 25, he has now run about 1,000 kilometres. Caribou Legs is running the 4,800 kilometres to Ottawa to this summer to highlight the 2.5 million lakes and rivers across Canada that have been stripped of federal environmental protection and to demand protection for our lakes and rivers. He says, "Our waterways need protection from Stephen Harper’s government and from big oil, gas and mining companies eager to sacrifice them for profit. I have a voice, I have legs, and I’m committed to using them to make change." He has experienced several water protection struggles on his journey so far including the dumping of biosolids in the Nicola Valley, the Ruddock Creek mine near Salmon Arm, dams that imperil the Columbia, Thompson and Fraser rivers, and coal trains near Revelstoke. In Calgary he says, "I asked if the Bow River was safe to drink and the reply was, 'Are you serious? No one drinks from the Bow River anymore!'" Caribou Legs is expected to arrive in Ottawa in September. To find out more about his run and how to support it, please click here. It is on that web-page that you will also find our petition calling on Prime Minister Stephen Harper and all federal parties leaders to #Pledge2Protect the lakes and rivers in this country. More than 7,600 people have already signed this petition. Caribou Legs with the Calgary chapter. Photos by Aleah Loney.